When we connect the primary windings of two transformers to a common supply voltage and the secondary windings of both the transformers to a common load, this type of connection of transformer is said to be the parallel operation of transformers. This is an economical method because a single large transformer is uneconomical for large load. If the transformers are connected in parallel, we require extra load then we can expand the system by adding more transformers in the future. Parallel operation reduces the space capacity of the substation when we connect transformers of standard size. The parallel connection maximizes the electrical power system availability as we can shut down any system for maintenance without affecting other systems performance. 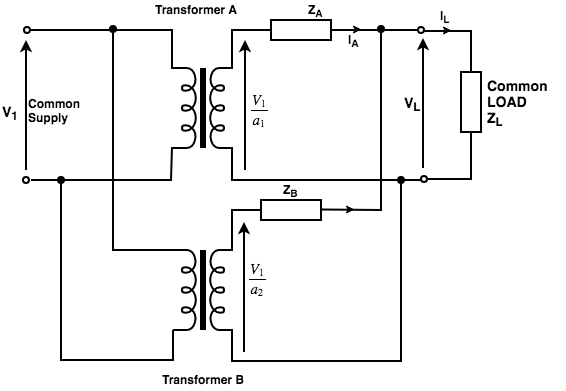 The diagram drawn below shows the circuit diagram of two transformers A and B connected in parallel. ZA = equivalent impedance of transformer A referred to the secondary side. ZB = equivalent impedance of transformer B referred to the secondary side. ZL = load impedance across the secondary side. IA = current supplied to the load by the secondary of transformer A.
IB = current supplied to the load by the secondary of transformer B. Fig: Two single-phase transformers in parallel. Each of these currents has two components; the first component represents the transformer's share of the load current and the second component is a circulating current in the secondary windings. They increase the copper loss. They overload one transformer and reduce the permissible load KVA. The transformers must have the same polarities. The transformers should have equal turn ratios. The voltages at full load across transformers internal impedance should be equal. The ratios of their winding resistances to reactances should be equal for both transformers. This condition ensures that both transformers operate at the same power factor, thus sharing active power and reactive voltamperes according to their ratings. The polarities of the transformers should be the same. Identical primary and secondary voltage ratings. Impedances inversely proportional to the kVA ratings. Identical X/R ratios in the transformer impedances. The phase sequence of the transformers must be identical. The primary and secondary voltages of all the transformers connected in parallel must have the same phase shift. NOTE: Under-balanced loading conditions, the three-phase transformer calculations are made on a per-phase basis. It is, however, preferable to perform calculations on a per-unit basis, particularly in cases where the primary and secondary connections are different.